Vijay Mallya’s aviation business has landed in a sea of red. Mallya has a survival plan, but he may need to look at drastic options to stay afloat. K. R. Balasubramanyam and Kushan Mitra go into the details. Hindsight is a wonderful thing, more so perhaps for smug business writers. However, the point of digging into our archives and pulling out these two gems is not to say “we told you so” or to make UB Group supremo Vijay Mallya look silly. Rather, it’s an attempt to highlight the hazards of the airlines business, which can upset the applecart of the most seasoned entrepreneurs and make their best intentions and grandest ambitions appear extravagant. Three years ago, Jet Airways was king of the hill, Captain G.R. Gopinath was the much-heralded pioneer of the lowcost format, and Mallya was looking at breaking even in a year. Today, Jet Airways and Kingfisher are preparing to work together to ensure they don’t cannibalise each other; Gopinath is now Non-Executive Vice Chairman of Kingfisher Airlines (after Air Deccan was merged into Kingfisher); and Mallya is at the helm of an airline that’s reeling under piled-up losses of Rs 2,500 crore and an estimated debt heap of Rs 4,000 crore. 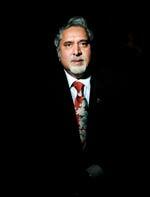 Mallya’s current task is clearcut: He has got to prevent Kingfisher from going under. He has got to do it solo, as policy norms don’t allow him to bring in an overseas airline as a partner. High levels of sales tax at the state level, which Mallya terms “punitive” and “like a guillotine”, aren’t doing him any favours. All expansion plans have been put on hold for now, with delivery of some 80 aircraft (between Kingfisher and Deccan) being deferred. Kingfisher has to first wipe out its accumulated losses, which Mallya expects to do in the next three years. “The airline business is such that you have to be prepared for losses and stay invested. A full-service carrier will take anywhere between five and eight years to break even,’’ says Mark Martin, Senior Advisor with consulting firm KPMG India. Mallya has a Herculean task on his hands. Over the past six months, during which prices of aviation turbine fuel (ATF) rode a rollercoaster, Gopinath’s truism that cheques fly faster than planes has come home to haunt Mallya. Last fortnight, he finally cleared part of dues—Rs 167 crore of Rs 967 crore to oil companies, and Rs 50 crore of Rs 220 crore to Airports Authority of India (AAI). “We have time till March 31 to clear the balance to oil companies and have worked out a settlement plan with AAI,” clarifies A. Raghunathan, Chief Financial Officer (CFO), Kingfisher Airlines. Apparent defaults on payments to General Electric’s aircraft leasing company have also prompted Mallya to return two of four disputed aircraft; a third was on its way back at the time of writing, the fourth will also be handed back (Kingfisher isn’t the only airline returning aircraft to lessors; other airlines have, too). Kingfisher maintains that no payments were pending, but the fact remains that Mallya’s expenditure in running the airline was higher than the monthly collections in sales in the April-September period. The losses, as a result, kept mounting— from Rs 157.86 crore in the April-June 2008 quarter to Rs 483.25 crore at the end of the following three-month period, on revenues of around Rs 1,350 crore in each quarter. In the first half of this fiscal, the airline has paid Rs 246 crore in interest. There’s a feeling that the group might be under-reporting the airline’s losses, having switched to a new accounting procedure. “The actual loss may appear much higher at Rs 1,119.71 crore for the April-September period if you also factor in deferred taxes of Rs 275.59 crore, and maintenance rent of Rs 203 crore payable to lessor aircraft. The company has shifted maintenance rent out from revenue expenditure under a new accounting practice,’’ points out R. Ramakrishnan, Partner with chartered accountancy firm R. Ramakrishnan & Co., in Bangalore. Mallya insists maintenance reserve cannot be counted as expense until the expenditure is actually incurred, and that’s the standard global practice. Mallya claims that neither is he under any financial stress nor is he scouting for money. “If the conclusion is that I require huge sums of money, I disagree with that. We have a very healthy cash flow due to healthy sales. We are collecting Rs 475 crore a month in our sales,’’ he told BT. He is relieved that the monthly expenditure has dipped to Rs 480 crore on the back of a drop in the prices of crude oil, from a peak of Rs 540 crore in August. But, on the other hand, a sharp depreciation in rupee has played spoilsport with Kingfisher’s dollar expenses like costs on lease rentals and maintenance. The high-profile billionaire is hunting for a “strategic investor” who would value his airline for its long-term potential; for this he is pushing hard for foreign direct investment (FDI) from a foreign airline, which current policies don’t allow. He would want to fly jointly with a foreign airline with which he can strike out an operational alliance, too. Investment bankers are not as gung-ho as Mallya about a potential partner being willing to ignore current market realities and focus on long-term prospects. Says K. Ramakrishnan, Executive Director & Head-Investment Banking, Spark Capital Advisors, Chennai: “I am a little sceptical about Mallya getting an “acceptable” value for his aviation business in these conditions. Today, there is a more pronounced disconnect between expectations in the minds of the sellers and readiness to pay in the minds of buyers. You cannot brush off current low stock market valuations as “unrealistic”. It is a reflection of the sentiment and is a discounting of immediate foreseeable potential.” Ramakrishnan adds that the possibility of somebody willing to pay a more acceptable value is higher in the liquor business, which enjoys superior profitability and leadership than in aviation.